This exquisite sterling silver Luckenbooth is traditional in design featuring two intertwined hearts for love surmounted by a crown for loyalty to Mary Queen of Scots. 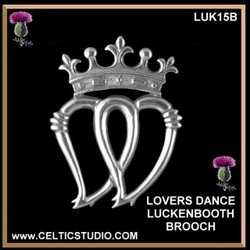 The Luckenbooth is a Scottish symbol of love, dating back to the 17th century and often given as a token of betrothal, affection and friendship. Wear one piece or the matching set, this is sure to become a favorite in your jewellery collection. This "Lovers Dance" pendant measures 1-1/4" (32mm) in length by 1" (26mm) wide and includes an 18" high quality chain. 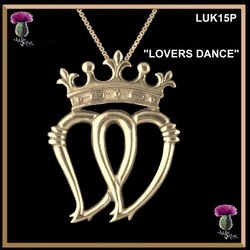 This "Lovers Dance" pendant measures 1-1/4" (32mm) in length by 1" (26mm) wide. The gold pendant does not include the chain. 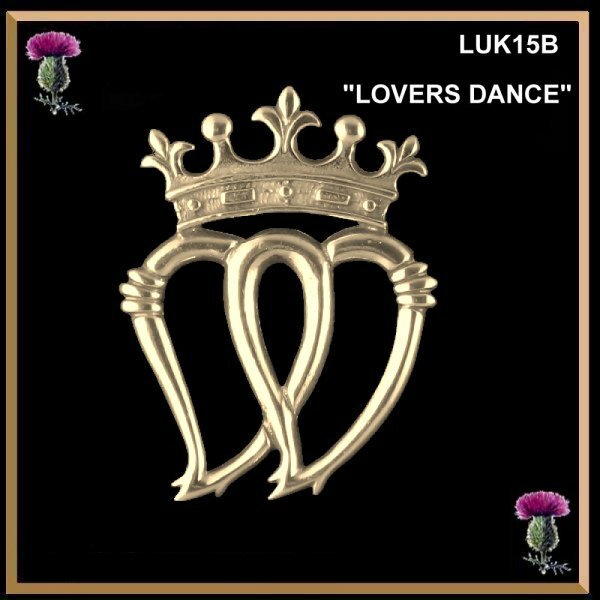 Our exquisite sterling silver 'Lovers Dance' brooch is a Scottish symbol of love, affection and friendship. It measures 1-1/4" (32mm) by 1" (26mm) wide with a high quality pin back.